A similar kind is found in South Africa, Namibia and Jordan (where it's always mounted upside down). 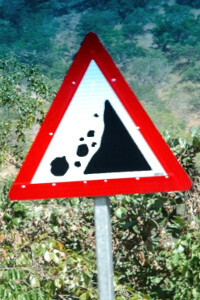 The difference is in the face of the cliff, the distances of the pair of small stones and the shape of the boulder at the bottom. Notice that this design is also different from, though very close to, the drawing found in the UK. The same design can also be seen in Rwanda.